What you will see here: Chhatris, cenotaphs, architecture & sunsets. Bada Bagh might surprise you with its greenery in the arid desert landscape of Jaisalmer. This was in fact the very idea when it was built back in the 16th century – to build a beautiful green oasis in the desert region. Originally, there were only a dam and a water reservoir, but successive rulers started to build memorials and chhatris in the memory of erstwhile rulers of this region. 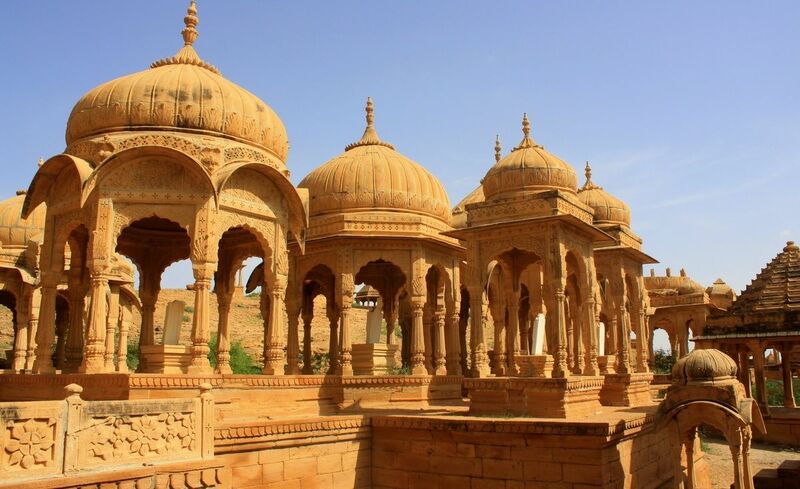 Today, this garden complex, just 5 km from Jaisalmer is a prominent tourist attraction of Jaisalmer. The cenotaphs have beautifully carved chhatris, with exquisite chiseled pillars and inscriptions made on yellow sandstone. The landscape garden besides Bada Bagh is soothing to the eyes, and provides a green touch to the entire region. There are many mango trees around too. Wonderfully sculpted cenotaphs and chhatris of former rulers are the special attraction of Bada Bagh. Pay special attention to carved pillars, beautiful sculpted chhatris, inscriptions and architecture of Bada Bagh. Also watch out for sunsets here, as they are most breathtaking and also visit the Jait Sar Tank, which is a water reservoir, and Jait Bandh, which is a dam. Bada Bagh is enveloped in serene calm and tranquility. Evenings are best to visit this beautiful site. Take your cameras and camcorders along, as the place is extremely scenic and photogenic, and will give you many photo opportunities. When to visit Bada Bagh? Winter season is best to visit Bada Bagh. The months from October to March are perfect, as there is less heat, and the overall weather remains sunny. Evenings are best, as the beautiful yellow sandstone cenotaphs appear golden in the golden rays of the setting sun. How to reach Bada Bagh from your hotel? Bada Bagh is just 5 km from Jaisalmer railway station. As this is a well-known tourist place, you can get rickshaws or taxis to go to Bada Bagh from your hotel. Yes, it would be good to explore Bada Bagh with a tour guide which you can hire from us (Chetram Voyages) at Rs 500 per day and free when you book a Jaisalmer tour package from us. Where to eat near Bada Bagh? Bada Bagh is very family & couple friendly and you should definitely visit this landmark on your Jaisalmer trip. And as mentioned above, the best time to visit Bada Bagh is either morning or sunset to get the best picture out of it.